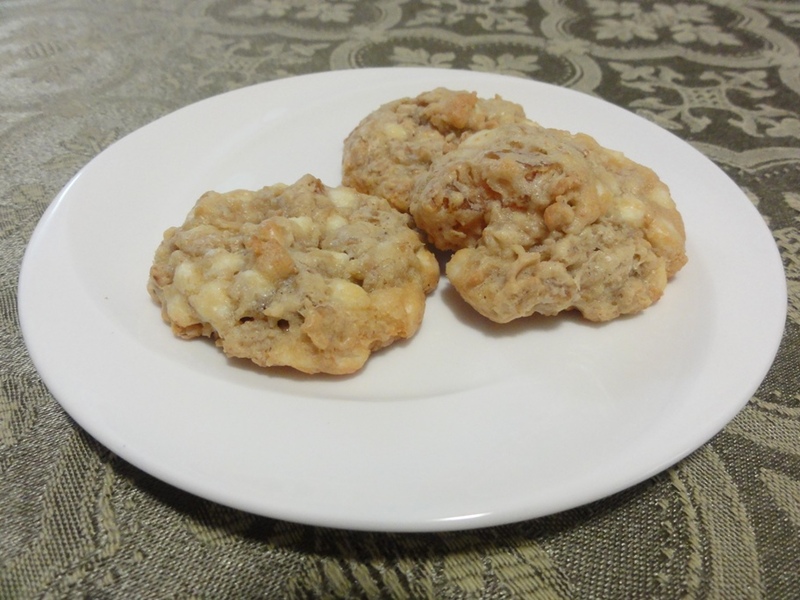 After making the Double Chocolate Walnut Cookies the other day and wishing I had white chocolate chips and macadamia nuts to fill them with, I was left with a hankering for baking something that involved white chocolate. At some point along the way apricots worked their way in there as well. So I asked the internet for “white chocolate apricot recipes” and wound up with a variety of options; lots of cookies, several scones, and a mini-muffin recipe that I’ve saved away to try later. The one that caught my attention the most was a recipe from Hershey’s. As evidenced by the recipes I’ve written up here so far, I like chocolate, and since they’re are a company that makes chocolate, this seemed like a natural choice. 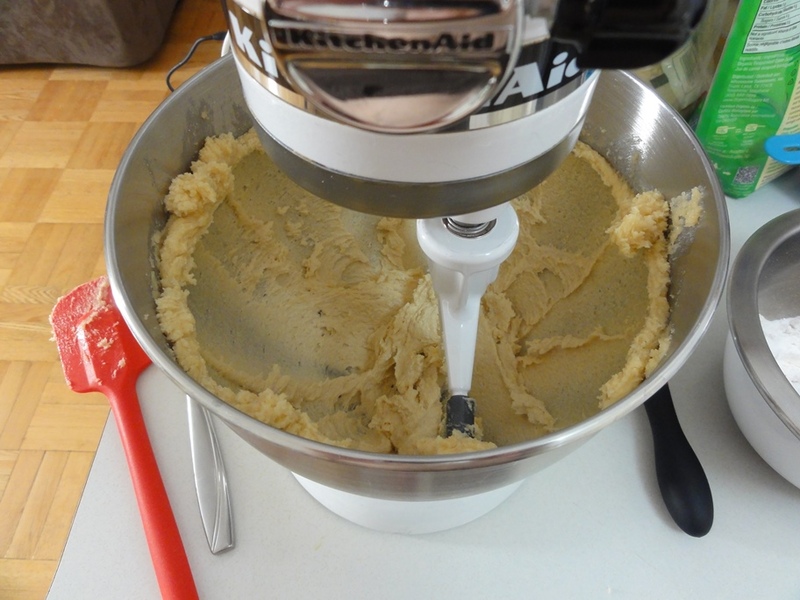 I added vanilla and a touch of salt to the recipe on account of nearly every cookie recipe I’ve ever made having 1/2 to 2 teaspoons of vanilla and a 1/4 teaspoon of salt in it, so I just take it as a given that cookies are better when they have vanilla and salt. 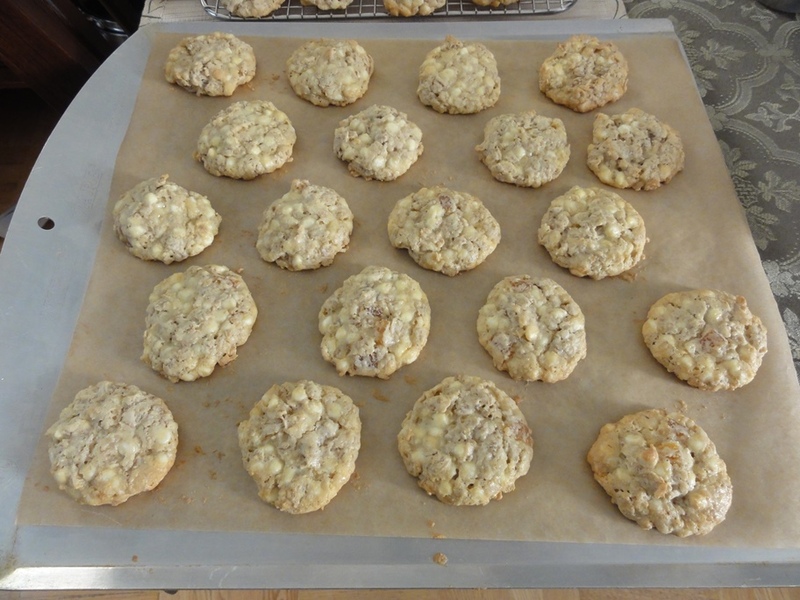 The cookies came out wonderfully; they’re soft, chewy, and hold together ably, the white chocolate and apricot go together very well, and the oats make them satisfying. Dicing apricots is the only annoying part of this recipe because they’re not the easiest things to chop up, but that aside these were very easy to make and I had a whole batch prepped, baked, and the kitchen clean in just over an hour, which considering the mess I make of my kitchen impressed me. Preheat oven to 375°F (note: not the usual 350°F!). 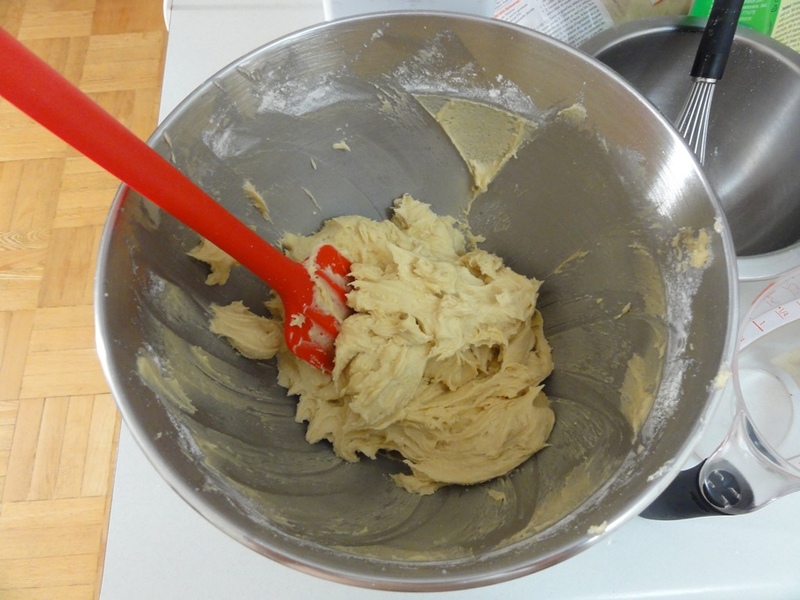 Beat the butter and sugar together until light and fluffy; about 3-5 minutes on medium speed. Add the eggs and vanilla and beat on low-medium speed until well combined. 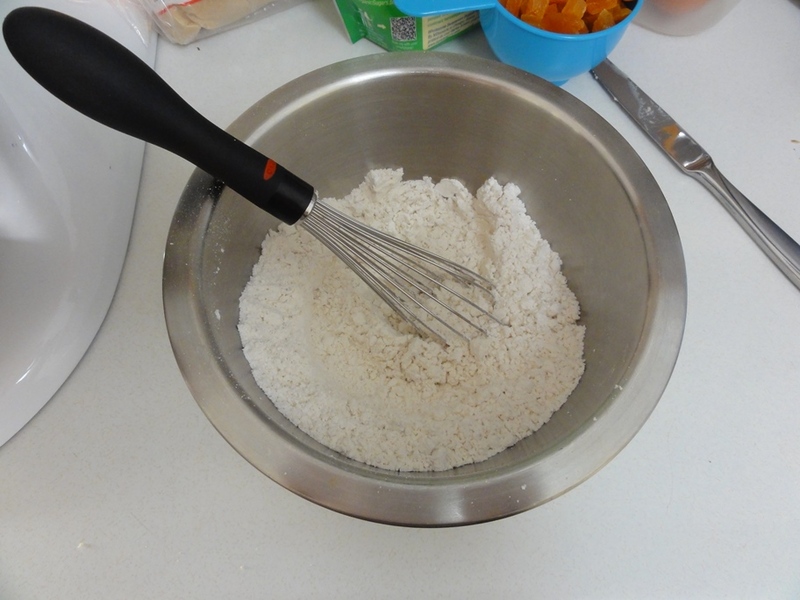 Add the flour mixture to the liquid ingredients and beat on low speed until well combined. 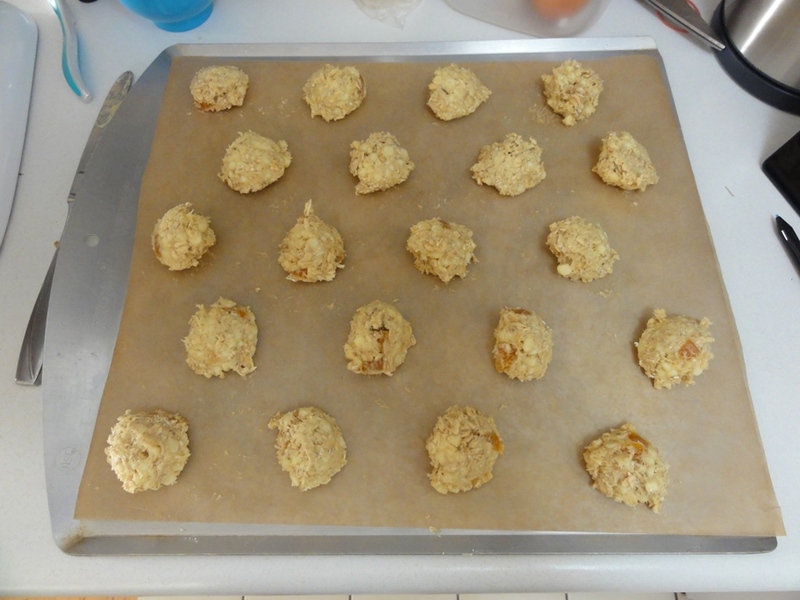 Fold in the apricots first, then fold in the oats and white chocolate chips. 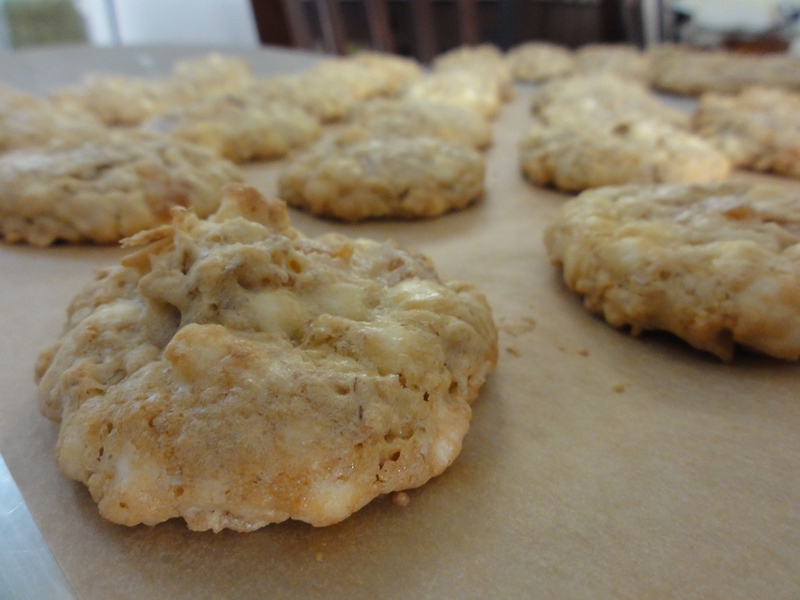 Form tablespoon-sized drops of dough onto lined cookie sheets. Bake for 7-9 minutes, until the edges are golden brown. Let cool for a few minutes on the trays and then transfer to wire racks. In retrospect I think I should have tried to cut up the apricots even smaller, to distribute the apricot flavor more evenly throughout the cookie. For bites that don’t include a piece of apricot these are still quite good as a white chocolate oatmeal cookie, but I wanted the apricot flavor to be predominant and for every bite to have a piece of apricot. For reference, since bags of chocolate chips at the supermarket (or if you happen to be blessed like I am to have a place where you can buy them from bulk bins) generally aren’t sold by volume, the white chocolate chips I used were “mini” size and 2 cups came to approximately 360 grams. The original recipe called for a 12 oz bag of normal size chips which would be 340 grams. I vote for the minis because they distribute just that little more uniformly throughout the batter. 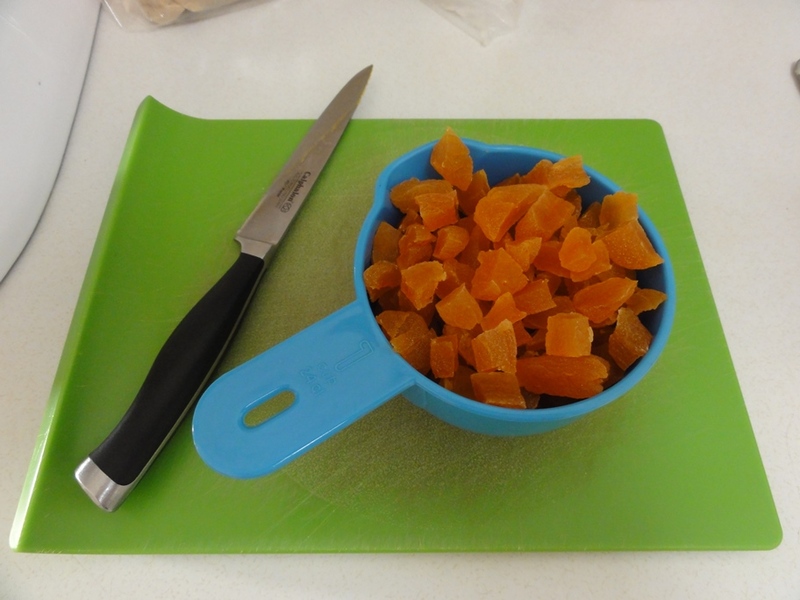 I didn’t even want to try chopping these in my food processor because they’re so sticky, so I did it old-school with a knife and chopping board – it took a while! There’s nothing fancy going on in this recipe, which is nice, and right here we’re just creaming butter and sugar. Eggs and vanilla go in next. 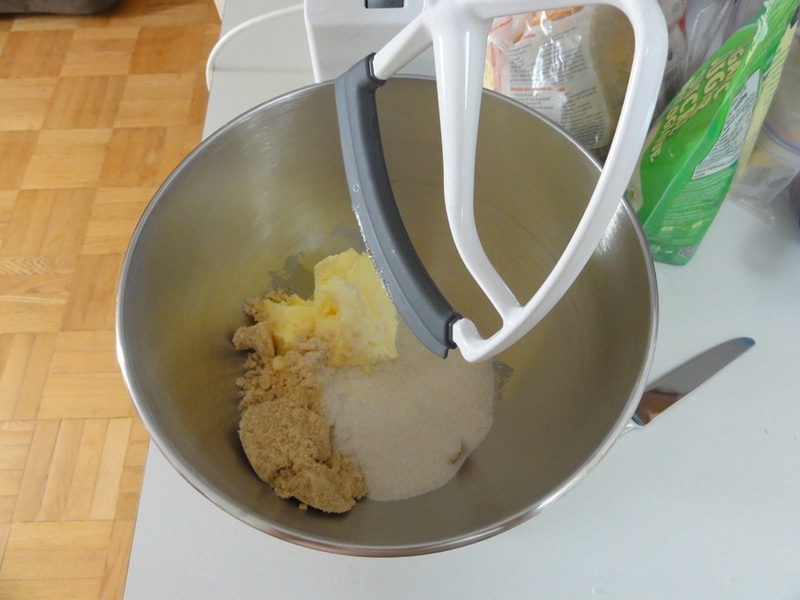 The original recipe didn’t explicitly call for whisking together the dry ingredients separately, but it helps to ensure that the baking soda and salt will be more evenly distributed throughout the batter. 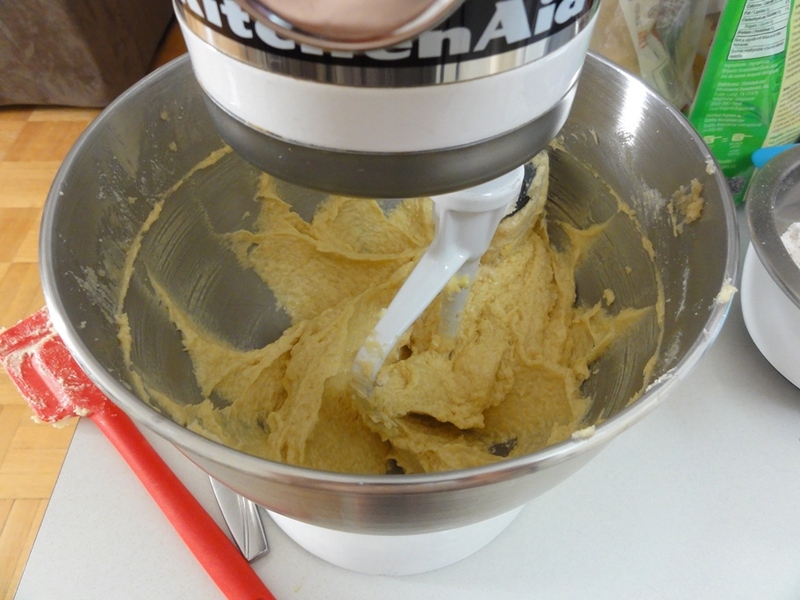 After the flour mixture has been added you’ll have a fairly stiff dough. I recommend not doing what I did here in just dumping the last three ingredients in (there are oats somewhere underneath all that wonderful chocolate). 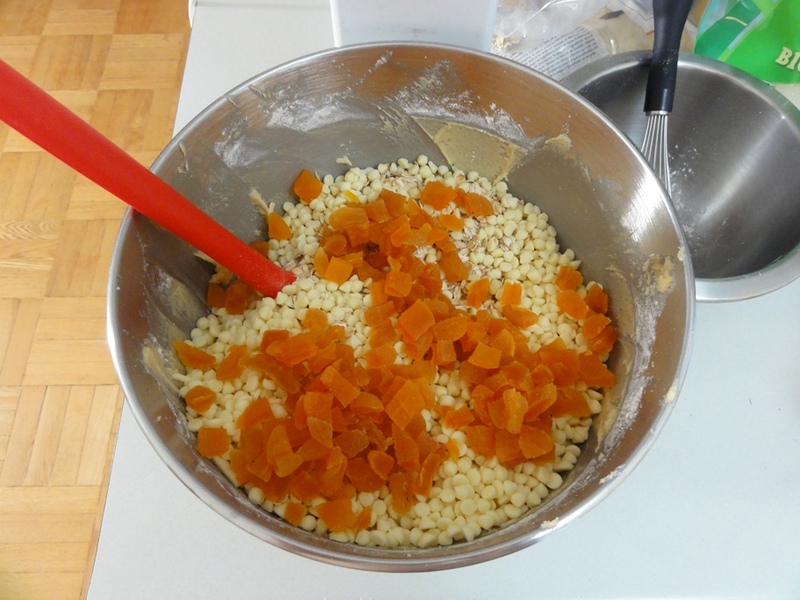 If you throw in the apricots first you can evenly distribute them through the batter before the oats go in and make it hard to stir. These cookies don’t spread out much; if you were careful you could probably get 25 on a sheet and save a little time baking, because the yield is going to push you up over 70 cookies. Oh man. I would eat the entire batch! Mmm, good choice! Glad you liked them!